The chart above is an update on one that I have published in the and shows a continuation of the longstanding trend toward larger teams. Back in the 1970s and 1980s, most patents listed only a single inventor. Since then, the percentage of one-inventor patents has steadily dropped while larger teams (3+ inventors) have flourished. I wonder whether a concrete example might help, one from the distant past, in exploring the question, can the (imaginary) PHOSITA be an entity with a level of technical knowledge higher than any one real person of ordinary skill in “the art”. I mean, suppose the claimed subject matter is a PTA (per-cutaneous, trans-luminal angioplasty) catheter and stent combo that can get from the entry point in your thigh as far as the stenosis in your brain, over a tortuous length of your vascular system. It can do this only because the strut structure of the nitinol metal stent has enough flexibility prior to its radial expansion, together with enough expansive force after radial expansion to hold your stenosed artery open. But not only that. The 140 cm catheter shaft must have enough column strength, all within a passing diameter not more than 7F, to be pushable all the way to the brain, together with enough steerability and bendability, so the laminar layer polymer structure of the shaft is of key importance. But not only that. We need an anti-angiogenic coating on the stent too. Not only that. How are we going to get the Taxol to stick to the Nitinol? Not only that. How are we going to release such a stent from such a delivery system, when the stent reaches the stenosis. All these engineering attributes have to work together, in order to achieve any advance in the “art” of medical practice. Which “art” then are you going to designate as the “pertinent” one of 35 USC 103? What does a real person have to do with the phrase “of ordinary skill in the art? Why are you interested in exploring a question that is in itself meaningless? Will you be taking the answer (whatever that answer happens to be) and trying to confuse/conflate yourself with what the use of the legal fiction entails? Do you really NOT understand these concepts to such a degree that you want to persevere in your inanities? So we need to determine what is the “art” to which the invention “pertains”, and then fix the attributes of the PHOSITA in that “art”. Let us not fall into the trap of supposing that the USPTO classification is what decides the “art” to which the invention “pertains”. With increasing scientific and engineering specialisation there is increasingly no real “person having ordinary skill” in that specific “art”. Take the flow of “evergreening” claims in the pharma space. In particular, a “dosage regime” claim that turns out to achieve a measurably higher level of “patient compliance” without detriment to physiological efficacy of the medicament. What sort of individual in their garden shed invents such subject matter? The inventorship entity on the patent must inevitably be more than one human being. When exploring obviousness, in disputed proceedings, one would take evidence from those who assess physiological effects of various dosage forms but also those who formulate such dosage forms. It has become routine, at least in England, to hold that the PHOSITA is to be regarded as a team, because to do anything else is to fail in the task of distinguishing what was obvious from what was not, at the date of the claim. More interesting, more topical, is to debate when the PHOSITA team for assessing sufficiency of disclosure must differ from the one that is relevant for obviousness. Suppose the non-obvious insight underlying the claim is to borrow a data analysis procedure from an unrelated technical field. You are in petroleum exploration and borrow something with which civil engineers are well-versed. For sufficiency of disclosure, the PHOSITA team would include such a civil engineer as one of the team; for the obviousness question, not. Do you see the circularity in your “reasoning”?
? why – and under what authority – would you even attempt to bifurcate this? Do you have a chart with the underlying numbers? If the number of applications filed by individuals is fairly constant, but corporations, which tend to name multiple inventors, are filing many more applications, you would get percentage results as shown in your chart. That is quite possible, but would still not show any sudden changes due to the AIA or Sup. Ct. decisions. Your “rah rah” for some “sudden” change is entirely misplaced, oh cheerleader of the Efficient Infringers. It has been a constant and unrelenting attack. Why would you expect “sudden”..? (this on top of the fact that you are over playing the meme of the “good professor’s” desired narrative, and that the “smooth” and “consistent” data picture presents a fallacy – as noted below. One sticks around here long enough, and the anti-patent narrative comes out across a rainbow of flavors. Thank you for your usual non-substantive and highly unprofessional attempted insults. Gee – kind of matches your typical and non-professional cheerleading. …and let me add, Paul, that anytime that you want to elevate your game to my level of “non-substantive” posts, you will have a ton of substantive additions to make. You are nowhere close with your cheerleading efforts based on the misrepresented “take-away” of linearity. Maybe you should spend less effort on whining and more effort on – you know – substantive contribution (supported by critical thinking). The drop in single inventor patents shown here is remarkably linear from 1975 to the present. Thus it does not show any significant impact from any part of the AIA or the significant Sup. Ct. decisions affecting patents during that time period. Is that consistent with the constant claims on Gene’s blog and elsewhere of their significant impact on individual inventor patent participation? Or is the constantly increasing complexity of technology and increasing R&D costs driving the linear decline in individual inventors? The consistency is interesting, but let’s not forget the measure is a percentage and not a gross number. In gross number terms then (given the actual increases in filings) the story may be vastly different. Keep going, “anon.” None of what you wrote makes much sense but it’s Friday so we can all use the laughs. Do you even have a clue how ignorant you make yourself with such a reach for a put-down? I have to wonder if you really are that clueless. Then you may realize that the graph in this current thread is based only on a percentage of patent grants. The actual numbers involved are not based on a static number per year, which makes a graph of percentage numbers against a year over year into a somewhat contrived picture (“contrived” being polite). 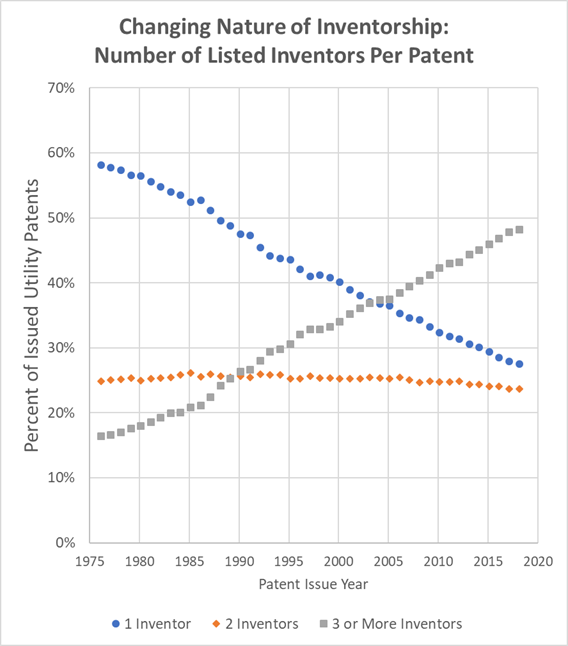 In other words, the immediate takeaway (to the unwary) is that the number of patents with single inventors has been DROPPING precipitously and steadily for several decades. That would be a plainly false take-away, once you recognize that the actual number of grants has not only been NOT steady – but as the link provided above show: has grown tremendously**. **What is especially noteworthy here Malcolm, is that you whine and fuss over what I have posted, all the while you have CONSTANTLY whined and fussed over the background that I reference – it’s like you see a post by “anon” and think to yourself that you simply must oppose the post, without bothering to see if the content of the post aligns with your own views. How very sad (even if totally unsurprising). Another relevant aspect of a 103 PHOSITA NOT being a “real person” is the amount and extent or scope of prior art the PHOSITA is imputed to be aware of. * That never seemed very clear or consistent to me in the controlling case law, even after KSR, so I would be interested in substantive comments from others? *not even to mention the inclusion of secret earlier filed unpublished applications of others, and the on-going AIA 102 “secret sales” issue. Would love to help you out here Paul – but can you provide me a starting point? What exactly is it that you think to be NOT clear or consistent? What? Not really wanting help, eh Paul? Maybe just want to whine a little eh? taken to be a team of NON-real individuals with complementary technical specialisations. (a note to the good prof: this is prime reason why sometimes being “lazy” (or perhaps simply being cavalier) is dangerous: you have people like MaxDrei with limited cognitive abilities overplaying the analogy you provide. Most everyone, I gather, would be quick to realize the actual difference between ANY trends of real inventors and the juristic person of the Person Having Ordinary Skill In The Art, and would not trip over themselves (as MaxDrei has done) with posting that PHOSITA is based so on real persons. That 40 years of experience around that same little block has more than anything else merely cemented in MaxDrie’s views of patent law. Fits with the emerging jurisprudence that confirms that the “skilled person” must often be taken to be a team of real individuals with complementary technical specialisations. I expect that the line of thinking you describe can make sense in Europe—which has a different philosophy of “inventiveness” than we have—but I don’t think that the PHOSITA-as-team idea works here. The idea of the PHOSITA here is supposed to be the ordinary artisan, not the ordinary inventor. Inventors, by definition, are not PHOSITAs. Just because inventors work in teams does not imply that so do inventors. That was back in the year 2010. I wonder when (if ever) the notion of “skilled reader as team” will permeate as far as the USA. Your last sentence is not clear to me. Inventors are not PHOSITAs, you tell me. I agree. Obviousness is assessed by reference to the PHOSITA, not the inventor. I agree. The PHOSITA is an imaginary construct, I agree. The court can, and must, define the attributes of the PHOSITA. When exploring obviousness through the witness testimony, one cannot cross-examine any PHOSITA. All you have is real people in real technical fields. From that witness testimony, however, the court has to reach a view, whether the claimed subject matter was obvious to the PHOSITA. So it’s no wonder that the court, at least in Europe, out of the sheer necessity to do justice between the adverse parties, increasingly decrees the relevant PHOSITA to be a team. I watch with interest, to see when this realisation first dawns, in the USA. Does a PHOSITA necessarily only have one skillset? If not, does the team-individual distinction matter? Interesting question (in the abstract), Ben. is not sufficient to carry the day. Greg really does not explain WHY he thinks that “as-team” idea does not works here. He starts into: “ The idea of the PHOSITA here is supposed to be the ordinary artisan, not the ordinary inventor.” and does allow that inventors may work in teams, but then jumps to his conclusion (corrected for the obvious typo) that inventors are not PHOSITA, THUS PHOSITA somehow cannot work in teams. There is a huge step missing in the logic of his explanation, as he provides no basis why a PHOSITA would not be able to work in a team setting. Mind you, this is not to say that Greg is incorrect. Just that his view cannot be sustained on its own. One possible avenue of support is that 102 and 103 prior art are MEANT to be different – and different in more than one way. 103 art was never meant to be merely 102 art, but in separate pieces. IF one does advance the notion that PHOSITA may be made up of whatever teams of different (fictional) “people,” each with their own “powers” for each particular piece, then it becomes conceivable that 103 art will b treated just like 102 art. All that one need do is merely postulate that a different team member brings each piece. You then have a situation that you have elevated obviousness into a type of “hyper-novelty” to which Congress expressly threw out in the Act of 1952 when Congress rejected the Flash of Genius “standard” of the Supreme Court. Remember, the Flash of Genius was geared to the same underlying hyper-novelty that even “piece parts” counted as much as if a reference already existed with all items. NEITHER of these paths are served with patents, or to be more precise, with the benefits of providing patent protection as part of the Quid Pro Quo. In the first instance, genius is as it is – and no form of offering the “fuel of patents” can create genius. If one only rewards that, then one has de facto removed the patent system from most all of common man. In the second instance, by its nature, accidental innovation does not – and cannot – benefit from the offering of patent protection, leastwise in the huge swath of follow-on patents. And lest we forget, MOST of innovation is of the type of follow-on patents. This just goes to show that once one has a (proper) foundation of understanding innovation, the strains of anti-patent thinking are much easier to see when they attempt to interject themselves. You are an examiner, right? You understand how to walk through the Graham factors in determining what PHOSITA can and cannot obtain, right? Do you see (based on the extension to teams) just why expanding a PHOSITA to be an unlimited “skillset” type of person is problematic as to the very purpose of the differe4nce between 102 and 103 art? DO you see the natural pitfall that your path takes you to (when applied to its logical conclusion)? I don’t see why allowing teams necessarily allows for any team, which is the way the skillset becomes unlimited. If the relevant art is closely related to BOTH materials engineering and catalysis chemistry, 103 art can continue to exclude the board game arts. You seem unable to recognize a fundamental difference between 102 and 103. I suggest that you start there. Well, I definitely recognize slippery slopes. By what mechanism do the board game arts become 103 prior art to an application in the field of high temperature catalysis, even allowing for “team” PHOSITAs? What’s the reasonable progression to go from saying “hey, BOTH inorganic chemists and material scientists contribute a lot to the issues here” to concluding that a board game maker’s skills are relevant to industrial catalysts? Obviously team PHOSITAs (and multi-skill-set PHOSITAs) would widen the scope of 103 prior art, but to characterize that widening as unlimited is a bit hysterical. Or self-interested. The reasonable progression would be the placement in the claim that would invoke the particular arts in question. You seem to say that you recognize a slippery slope condition, but then you fully embrace that slippery slope, and seek to use as some “clinching example” a combination that may not appear in any actual claim. That does not distinguish – nor prevent – the slippery slope. Your view still swallows any and all differences between 102 and 103 art. Thus, your view cannot be correct. Does a PHOSITA necessarily only have one skillset? Yes. That is part of the definition of the PHOSITA. The PHOSITA is a sort of idiot savant, knowing everything that there is to know about the existing state of one art, but nothing else. Greg, would you care to tell me (and perhaps also Ben) precisely why every jurisdiction needs the notion of a PHOSITA. Something to do, perhaps, with the need to judge patentability objectively, and with distinguishing between, and keeping rigorously separate, the very different concepts of novelty and non-obviousness? The “why need” is tied to the differences between 102 and 103. I would be interested in seeing Greg add to the explication that I have already provided (you are welcome – again – MaxDrei). Isn’t that contrary to several statements in KSR that a POSITA also has common sense? You are absolutely correct in that the Supreme Court “moved the goalposts” [yet again] in their KSR decision. Yet another example of the Court writing patent law instead of merely interpreting patent law. One changing aspect from KSR was to change the view from a single fixed Art to a more expansive “solution set” that is not limited by any one Art field. Person Having Ordinary Skill For The Provided Solution. From PHOSITA to PHOSFTPS (the linguistic change resembling Bloom County’s Bill the Cat’s THBBFT is a bonus). Side note 1) There is of course an additional wrinkle to this aspect of the story: Restriction Practice. GIVEN the Office predilections for restrictions based on “too much work,” many such restrictions are improper given the rewritten law of the Supremes. If “the art” is a single art, that seems like it would make implementing a common organic chemistry reaction at an industrial scale with common chemical engineering methods/equipment per se non-obvious. Should that be non-obvious? How is your “industrial scaling” claimed? Have you thought through your question? Ben, if I understand your question correctly, I think the answer is that it is per se obvious – if implemented as you say “with common ChE methods/equipment”. Because I believe the skilled one in your question is not the organic chemist. It is the chemical engineer, tasked with taking the chemist’s (known) reaction to industrial scale. But if “the art” is simply chemical engineering, the reaction itself is likely not known to an ordinary chemical engineer. But I get what you mean and let’s say it’s not a “common organic reaction” but instead something the ordinary ChE who didn’t have a focus in, like routine polymerization reactions, wouldn’t necessarily know. Even then, as the person skilled in the (ChE) art, he doesn’t need to know (by her/himself) how to invent the routine polymerization reaction. It’s given to the ChE to scale it up using “common ChE methods”. I think that the field of organic chemistry has many common reactions that are not taught at the undergraduate level of EITHER Chemical Engineering or Chemistry. But the chemical engineer PHOSITA can’t combine the reaction with his methods if the reaction itself is unavailable to him. …so why is “at the undergraduate level” being stressed by you here? Have you pre-determined what your PHOSITA is? Have you objectively applied the Graham Factors? Not to pick on you personally Ben, but I have found examiners in general have little understanding of the law to which they must examine too when it comes to obviousness. I cannot remember but a very small percentage of processing in which a complete office action is NOT spent teaching the examiner how to properly apply 103 (including showing the required development of who PHOSITA is). It very much depends on the language of the actual claim – as one should expect. Ben – you have that hypo claim language yet? Hi anon, I saw you mention something similar above. But why should it matter what language one puts in the claim? Recall the given here is ordinary organic reaction being scaled up using techniques common to all chemical engineers. What about that narrow hypo can be non-obvious? Because it is the claim that dictates who the PHOSITA is. Change the claim language – change (possibly) the PHOSITA.